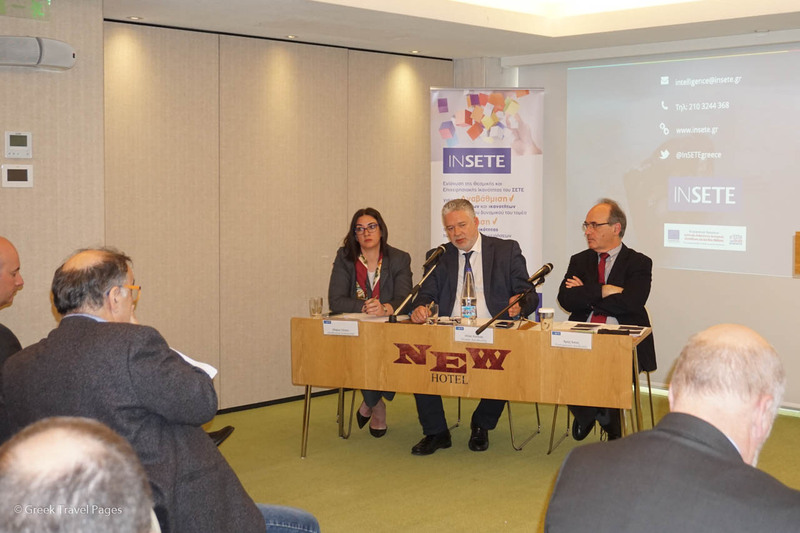 SETE Communications Director Maria Gatsou, INSETE General Director Ilias Kikilias and INSETE Research Director Dr. Aris Ikkos. 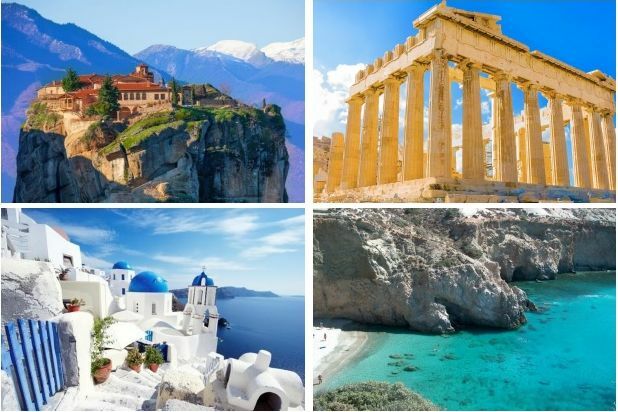 Although Greece offers a competitive tourism product on top satisfaction pillars, the country falls behind in other factors that influence the visitor experience. 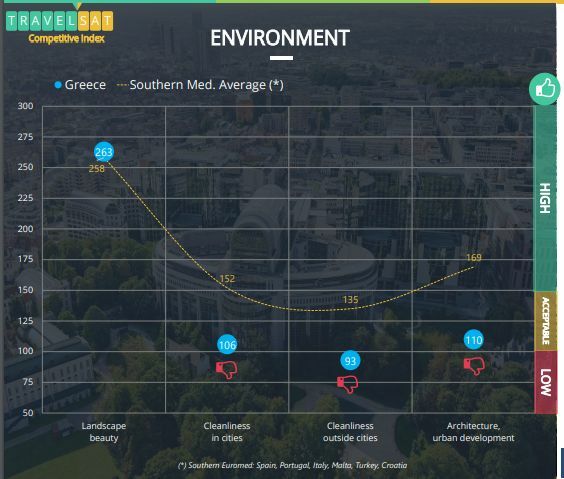 Greece outperforms its competitor destinations in southern Europe regarding top factors that influence the experience of visitors, but lags significantly in destination management issues, including cleanliness, road infrastructure and providing information assistance to guests. 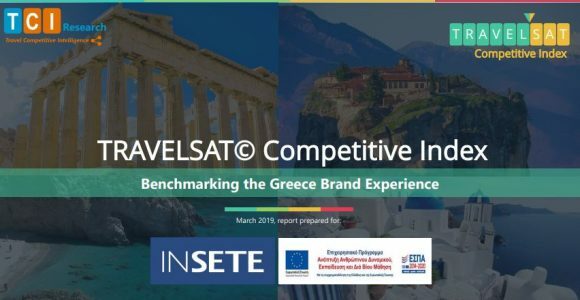 This was the main conclusion of the study “Benchmarking the Greece Brand Experience”, presented to the media on Wednesday by INSETE, the Greek Tourism Confederation’s (SETE), which measured the factors that drive the visitor experience in Southern Europe countries, including Greece, Spain, Portugal, Italy, Malta, Turkey and Croatia. 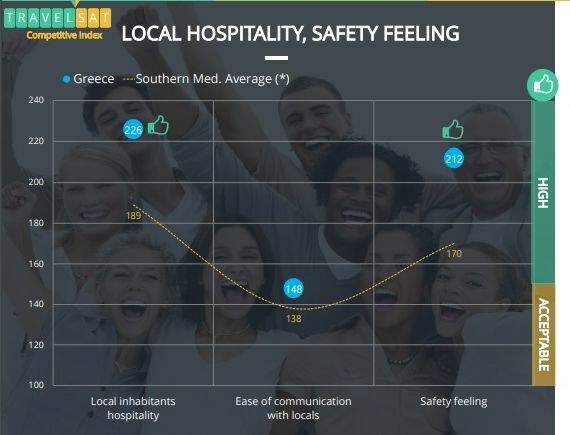 As shown in the study, guests in Greece have given the country a high rating, placing it ahead of competitor destinations regarding the five top factors that shapes the visitor experience: Hospitality of locals, Accommodation, Safety and feeling of security, Local food and Beauty of Landscapes. According to the study, the hospitality of the Greeks and the feeling of security – two highly influential pillars of the visitor experience – are both clear competitive assets for Greece. The country also significantly outperforms the competitive norm on all facets of the accommodation experience, achieving an excellent score in terms of staff hospitality. 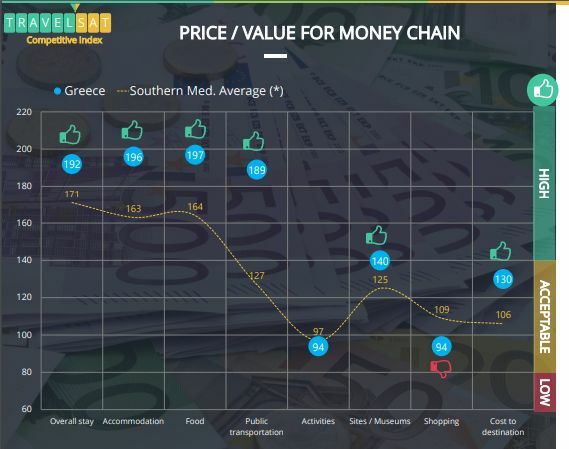 On price and value for money dimensions Greece performs particularly well. In the local food factor, the study referred to Greece as a “European champion” as the country received rave reviews in all aspects of the experience (quality, diversity, value), surpassing the competitive average. Greece also enjoys a very strong competitive position for its offered beach experience, particularly well rated for their beauty, diversity and offering great safety for swimming. On the other hand, the study revealed that Greece’s average competition tends to offer perceptions of cleaner beaches. Moreover, while Greece equally excelled with the Southern Med norm for the landscape beauty, visitors expressed lower satisfaction with architectural and urban development as well as for the cleanliness, both in the city streets and outside cities. Greece also reached lower-than-competition levels regarding its road infrastructure, airport access and signposting. What perhaps came as a surprise was that Greece scored low for its cultural experience offer. Despite the presence of world-renowned and iconic historical attractions, Greece (in general) was less favorably rated than average competition for the diversity and maintenance of its historical sites. Competition also surpassed Greece’s satisfaction scores for evening and night activities. The destination also underperformed in regards to the shopping experience it offers and did not reach competitive levels for offering visitor assistance (info centers) along the stay (physical or digital). 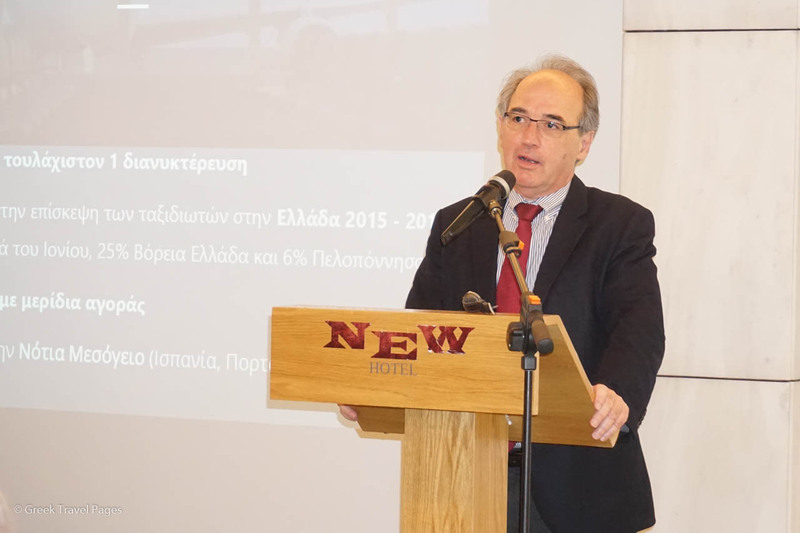 “In the five main factors we see that Greece is a very powerful tourism product and it is worth noting that these factors are relevant with the attitude of the people (Greeks) to a great extent and private infrastructure as well as with the gift of nature, which offers the beauty of our destinations,” said INSETE Research Director Dr. Aris Ikkos while presenting the study. “However, Greece has very poor ratings and much worse scores than the competition on issues related to destination management,” Ikkos said, commenting on Greece’s performance in intangible factors, such as cleanliness of individual destinations and road infrastructure. “We have a mix of very good and bad scores, so basically we have to see how to manage our destinations in a way that will rely on our strengths to improve the factors that are keeping us behind the competition,” Ikkos added. Concluding, the study underlined that Greece generates high and competitive levels of overall satisfaction and value for money during the stay. “One possible challenge though in the long-term concerns the lower-than-competition repeat visit intention: this should encourage Greece tourism players to generate more loyalty and ‘reasons to come back’, while travelers are exposed to an increasing number of destinations’ choices in and outside the region,” the study notes. The study, which is based on 654 post-visit interviews among travelers in Greece during the 2015-2017 travel period, was conducted by TCI Research, on behalf of INSETE, following the TRAVELSAT methodology. TRAVELSAT Competitive Index is the global independent UNWTO endorsed standard measuring visitor experience quality. To read the whole study, press here. I’ll take my time and read thoroughly the complete study. All in all, conclusions are of great importance if we need to interpret this current trend.